Special counsel Robert Mueller’s team thinks Paul Manafort lied to them while he was supposedly cooperating with prosecutors in the Trump-Russia probe — and that Manafort may well have been trying to get Trump to pardon him. Mueller’s prosecutors made these arguments during a sealed hearing on Monday, February 4. A partially redacted transcript of that hearing has now been posted by CNN, and it reveals new details on the special counsel’s thinking. For instance: While chairing the Trump campaign, Manafort secretly met with his longtime Russian associate, Konstantin Kilimnik. Prosecutor Andrew Weissmann said the FBI thinks Kilimnik “has a relationship with Russian intelligence.” So, he said, the meeting goes “very much to the heart of what the Special Counsel’s Office is investigating” — namely, the Trump campaign’s potential connections to the Russian government. Manafort’s attorneys argued that he didn’t deliberately lie, but rather there was a combination of memory failures and mix-ups from Manafort, and misunderstandings from the special counsel’s team. To recap: Manafort was indicted by Mueller in two venues, Virginia and Washington, DC. He was charged with tax violations, bank fraud, lobbying, and false statements — but he was not charged with any crimes related to Russian interference in the 2016 election. Last August, Manafort was convicted at his first trial, in Virginia. Then, he struck a plea deal in DC to avert the second trial — and committed to cooperate with the government. Weissmann revealed in court that, though the government went into the deal “with good faith,” he could not say at that point whether Manafort “was being truthful” in his proffer or whether he’d be able to substantially assist the investigation. 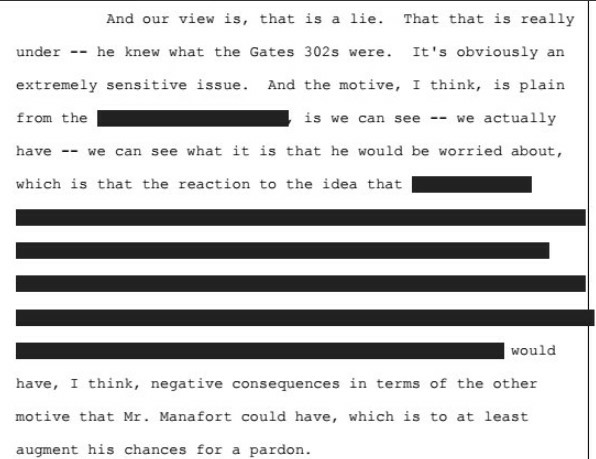 And in fact, later in the transcript, there is an unredacted reference to “a pardon” as one potential motivation Manafort could have. Manafort had three proffer sessions with Mueller’s team before he agreed to his plea deal, and nine further questioning sessions as well as two grand jury sessions afterward. But in November, the special counsel brought all this to a halt and told the court he believed Manafort had breached his cooperation commitment by lying. Now, both Mueller’s and Manafort’s lawyers already agree that the government has reason to believe Manafort breached his plea agreement. But now, Judge Amy Berman Jackson is considering whether to take these purported lies into account when she sentences Manafort. That was the reason for Monday’s hearing: to weigh the government’s case that the lies were deliberate, against the defense’s case that they were unintentional. In the dueling filings leading up to the new hearing, we’ve gradually learned more and more details on what, exactly, Mueller has accused Manafort of lying about. There are five different topics. In 2016, Manafort helped set up the pro-Trump super PAC, Rebuilding America Now, and installed a longtime friend to run it. That super PAC paid millions to a political ad-buying firm — and that firm then used $125,000 to help pay Manafort’s legal bills in 2017. Prosecutors say that, while trying to assess Manafort’s financial assets and whether people were “holding money” for him, they asked him about this payment, and he gave three different stories about it. First, Manafort said it was the repayment of a loan he’d given to the super PAC chief. Second, he said it was a repayment for work he’d helped the head of the ad-buying firm get. Third, Manafort said it was a loan from the head of the ad-buying firm to him. 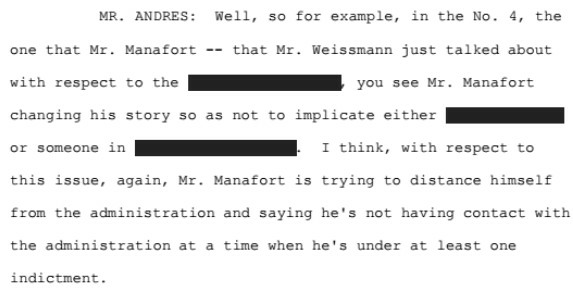 Weissmann explained his “educated guess” about what Manafort was trying to hide. The details are redacted, but he seems to be saying that the super PAC head and the ad-buying firm had a kickback “scheme” — and that the super PAC head “may have” had a similar arrangement with Manafort. But Weissmann said he wasn’t certain of this. The translation is that prosecutors seem to think Manafort may have been skimming money from a supposedly independent, donor-funded super PAC he helped set up to support Trump. But they are not saying they’re certain this happened (and it’s also not clear it necessarily would have been criminal). In response, defense lawyer Richard Westling said he didn’t think Manafort’s story about the payment changed all that much, and that he doesn’t “think” the hypothetical kickback scheme actually occurred. Back in June of last year, after Manafort had already been indicted twice by Mueller’s team, they piled on two more charges against him — and against a longtime business associate of his, Konstantin Kilimnik, who Mueller says has ties to Russian intelligence. 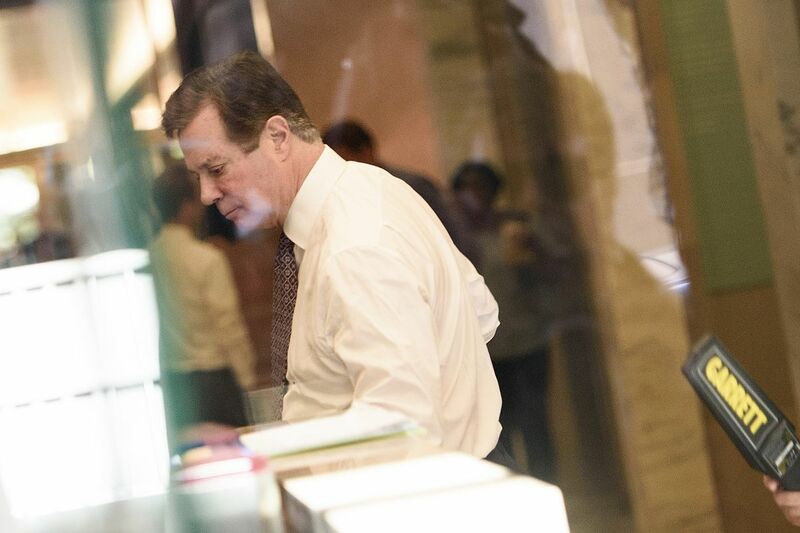 One charge accused Manafort and Kilimnik of conspiring to obstruct justice, by encouraging witnesses to give a false story regarding their work for the former government of Ukraine. And when Manafort agreed to his plea deal with Mueller a few months later, he admitted this charge was true. However, Mueller’s team says that after the deal was struck, Manafort backtracked on this story and told them that Kilimnik did not knowingly commit a crime. After a discussion with his lawyers, though, Manafort reverted to the story he told during his plea deal. Defense lawyers claimed that there was a misunderstanding, that Manafort didn’t actually change his story, and that even if he did he corrected it in the very same cooperation session. Mueller’s team also says Manafort repeatedly lied to them about a series of interactions he had with Kilimnik. Many of these details are hidden, but we know from a previous redaction error that much of this involves a supposed “peace plan” for Ukraine that Kilimnik was apparently pushing. This plan was aimed, it seems, at settling the conflict between Russia and Ukraine on terms that would be favorable to Russia. Manafort originally told Mueller’s team that the peace plan only came up once between him and Kilimnik — at a meeting they had in New York City on August 2, 2016, while Manafort was chairing Trump’s campaign. Manafort said he rejected the idea. Weissmann argued that Manafort lied about his continuing contacts with Kilimnik. Far from dismissing the peace plan as a bad idea, he asserts, the evidence shows Manafort was in favor of it and continued to work with Kilimnik on it all the way up to early 2018. In a tantalizing statement, Weissmann told the judge the August 2016 meeting in particular “goes to the larger view of what we think is going on” and “goes to the heart of what the Special Counsel’s Office is investigating” — namely, the Trump campaign’s connections to Russia. It’s a meeting of the sitting Trump campaign chair “at an unusual time” with someone who the FBI thinks has “a relationship with Russian intelligence,” he said. And he thinks Manafort lied about it. Following this is a discussion about another redacted topic that appears to be about the accusation that Manafort shared presidential campaign polling data with Kilimnik, data that Kilimnik was then going to share elsewhere. Manafort’s lawyers responded by suggesting this claim came from Rick Gates and attacking Gates’s credibility. The fourth topic Mueller claims Manafort lied about is not about the special counsel probe, but rather a Justice Department investigation in another district. Once again, the details of this investigation are redacted. But there’s enough in this transcript to make clear that it relates in some way to the Trump campaign or administration. The topic, Weissmann says, arose during Manafort’s proffer, when they asked him about an email from someone “about a potential way of saving the candidate.” So Manafort told a story to explain that email. The story Manafort told during his proffer, Weissmann says, suggested “a path that we thought was potentially optimistic in terms of providing information” for this separate investigation. So after Manafort agreed to the plea deal, Mueller’s team brought in the other DOJ prosecutors involved. But then, they say, Manafort changed his story to offer a “very watered-down version,” omitting “everything, basically” about one relevant person. However, once defense lawyers reminded Manafort what he had already said about this during his proffer, he reverted back to the more incriminating version of events. So, it’s clear this investigation involves Trumpworld. We don’t know what it is, but one possibility is the probe into Trump-related hush money payments being run by the US Attorney’s Office for the Southern District of New York. It could also be a new probe. Judge Amy Berman Jackson seemed to find prosecutors’ arguments at least somewhat persuasive on the first four topics (which, of course, doesn’t predict how she’ll rule). But she indicated she was skeptical of their arguments on the fifth and final topic: contacts Manafort allegedly had with the Trump administration. The special counsel’s argument is: Manafort told them he had no direct or indirect communications with the Trump administration while they were serving. But in fact, they claim, Manafort had at least some indirect communications. It’s difficult to know what to make of this section. The names and specifics are redacted, ao it’s very unclear what’s going on. But the defense lawyers claimed that the two examples the special counsel is using of “indirect” administration contacts are stretches. “Of all of [the five topics], this is the one where I have the most difficulty figuring out where the real contradiction is of moment to the investigation,” Judge Berman Jackson said. Manafort’s sentencing in DC is currently scheduled for March 13, and the judge is expected to issue a ruling on whether Manafort lied during cooperation before then. Manafort also has to be sentenced in Virginia, and he currently has no set date for that. He remains incarcerated, as he has been since last June.